I am delighted to be leading the bassoon studio at UT’s Butler School of Music. In the studio, I aim for a consistent atmosphere of mutual respect, candidness, patience, and humor, along with a flexible combination of encouragement and challenging demands, in order to nurture in each student the inspiration to reach his or her personal best, and to share their passion for music with others. 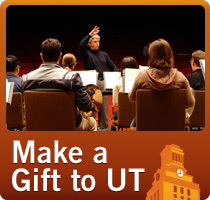 A high percentage of UT’s bassoon graduates hold positions in major symphony orchestras, university faculties, and public school music programs and have excelled in the International Gillet-Fox Bassoon Competition, the Meg Quigley Vivaldi Competition and the UT Concerto Competition (check out the alumni section of this site). The size of the studio ranges year to year from 11 to 14, with about 2/3 of those being undergraduates. The bassoon studio is a close-knit, supportive group of students who enjoy playing in ensembles together and having reed-making parties. We hold studio class once a week to provide solo performance opportunities, and a forum to discuss issues such as orchestral excerpts, performance anxiety, teaching strategies, effective practicing, etc. In addition to studio class, we hold weekly reed making class, which freshmen are required to attend, and others are welcome as well. Every semester the Bassoon Class Recitals provide opportunities for each student to perform solos in a public setting with the excellent students in the Butler School’s outstanding Collaborative Piano program. In the 2018-19 school year, the studio raised funds to attend and perform at the Meg Quigley Vivaldi Competition and Bassoon Symposium in Los Angeles and had a life-changing time attending master classes, concerts, and the competition. It is such a pleasure to join my students on their quests for musical excellence and beauty!